Electricity is one such thing that keeps us going in this busy world, just imagine the world where we don’t have enough electricity to power up our Laptops, Phones, Televisions and other electronic items, scary isn’t it? Well yes, it sure is. We are so connected to technology that keeps growing and gets innovative day after day but the underlying fact is that electricity is what that powers the gadgets and other products. This is one such fact that none can deny whatsoever. When things go your way just as you wished, there won’t be any problem but, just imagine the consequences when you go beyond the limit. My point here being when you have electricity in surplus you need to utilize it carefully before the world or you run out of power. In this post, we will guide you through few simple yet most effective ways to save electricity in our day-to-day life activities. So let’s get started. We have a lot of bulbs, tube lights, CFLs and LEDs lighting up our homes. A lot of these consume high amounts of electricity and end up increasing your monthly bill. Simply turn off lights and other equipment when not in use. Instead of leaving them on standby mode, switching them off from the source leads to a 20% decrease of daily power consumption. Switching off bigger appliances like TVs, geysers, music systems and computers is the most important step in decreasing the total consumption of electricity at your home or office. For people who don’t live near the coast or the equator, Winter is a time when the temperature drops down to single digits, and hot water is required to bathe or wash hands, whenever the need arises. Instead of switching on water geysers for the entire day, try to plan your baths and dish cleaning processes so that you have a 30-minute gap before which you can switch on the geyser and enjoy hot water later, during the shower. You can also aim for shorter showers or clean all the dishes in one go, instead of multiple times during the day. If you take long showers before going off to work and after coming back, ensure that the showerhead you use is efficient enough to utilize the least amount of water required. Some shower regulatory standards set a limit of 10 litres per minute as the limit at which electricity will be conserved effectively. A good and modern product can save both water and electricity without making your shower experience any worse, and the saving usually pays back the expenditure within a couple of months. There are technologies in the market, like CFL and LED, which help you maintain the same level of brightness in your house while cutting down on the electricity consumption of traditional light bulbs. CFLs generally tend to use almost 75% lesser energy as compared to older incandescent bulbs in the market. Another technology, LED or Light-Emitting Diodes are even more efficient and last longer than all other kinds of bulbs. Also, their installation cost is high but the returns, in terms of electricity saving, will help recover the same. Indian summers are among the worst in the world but a lot of us have become accustomed to them over the years. Every household has a couple of Air Conditioners, whether split or window, which run almost 24×7 during the peak summers. If these ACs have been the latest cause of electricity bill spikes, you may consider switching to much cheaper options like ceiling fans and coolers. Try to keep the house ventilated during the morning and then use the coolers to circulate the air during hot hours. The market is abuzz with special electricity usage monitors that help track your real-time electricity and give you a quantitative figure as to how the monthly bill would look like. By purchasing such a monitor, you can get detailed information about what appliance use the most amount of power. This can enable you to limit or restrict the usage of these devices and replace them with other energy-efficient alternatives. Initially, energy saving wasn’t on the priority list for many appliance manufacturers, hence, the older devices generally tend to be heavy power suckers and can give you a shock when the monthly electricity bill arrives. With energy-efficient options now in the market, you can always look out for such appliances when picking your next big purchase. Always look out for things like five-star energy ratings and BIS branding marks on the appliances. Better than relying completely on heating and cooling devices, is the idea of efficiently insulating your house. Make sure that your doors and windows have sturdy mechanisms that don’t allow any exchange of air. If there are any cracks or openings, seal them up using insulated weather strips. This helps prevent the inner air temperature getting closer to the one that is outside, whether hot or cold. While the conventional electricity options are there, you can also opt for other renewable options of energy like solar and wind, now that they are quite widely available in the markets. There are a lot of companies offering such alternatives, but a wide research is needed. Also, the investment can be reimbursed over time. Another easy concept of conserving electricity is by switching off all kinds of appliances in your house for around an hour, every week. This ensures that your electricity bill stays in limit and also that the appliances get some kind of resting time in between all the strenuous work. Use a Laptop instead of PC/Desktop because with the laptop you don’t need to continuously power on the system as it runs on battery. So you might be turning on the power when needed. But with PC you will have to turn on the electricity and power it up all the time you are using it. This is one effective way to save electricity. 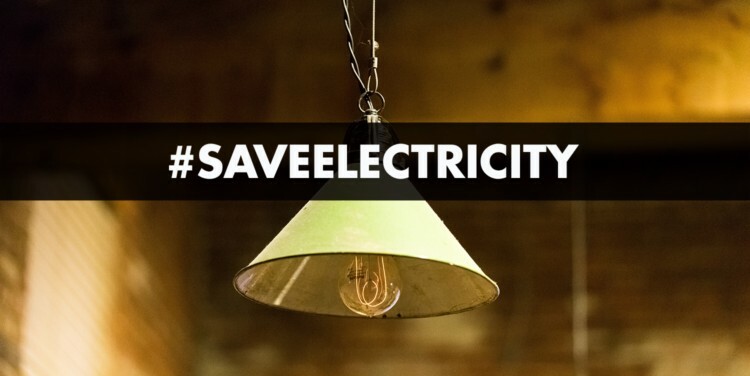 Though there might be so many ways to save electricity, more often than not we forget turning off the fans, tube lights, and other electricity-consuming sources. So you need to know your surroundings and find the ghost busters which are consuming more electricity and focus on limiting their usage. So, these are some of the few most effective yet simple steps to save electricity in our day to day life. Hope you found this article impressive and if yes, do share a comment down your thoughts about it. Passionate About Gadgets and Gizmos, now if you don't find me writing anything its just I am busy watching some T.V series. Get in touch with me if you would like to discuss anything.